23 March 2006 sees Frontline series 2 and 3 out on DVD after years of waiting! Starring Rob Sitch as Mike Moore and Jane Kennedy as Brooke Vandenberg. Thanks to the forum members BenG and Kichigai for alerting us to this important event. The DVD of Frontline series 1 was devoid of any extras so we aren’t expecting much from this series, but hey – perhaps we’ll be pleasantly surprised! 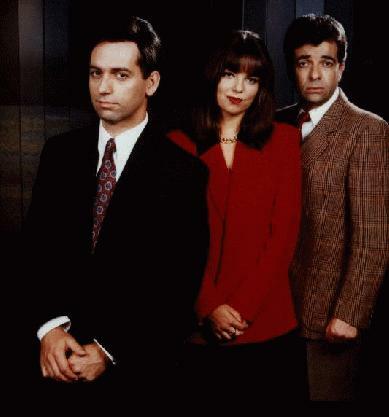 For those who never got to watch the three Frontline series, which aired in the mid 90s, it was a biting, satirical take on the current affairs formula prevalent on Australian TV screens in shows like A Current Affair, Real Life and 60 minutes. In fact, it was ‘The Office’ of its day, with its fly-on-the-wall ‘reality TV style’ comedy. The spin and deception that goes into producing a current affairs show was skillfully deconstructed—what appears to be a worthy topic being broadcast to the masses is, thanks to the Frontline’s top cast, stripped to pieces and revealed as being nothing more than ratings-grabbing, sensationalist tat.